Are You Fully Plugged-in to Your Ancestry? 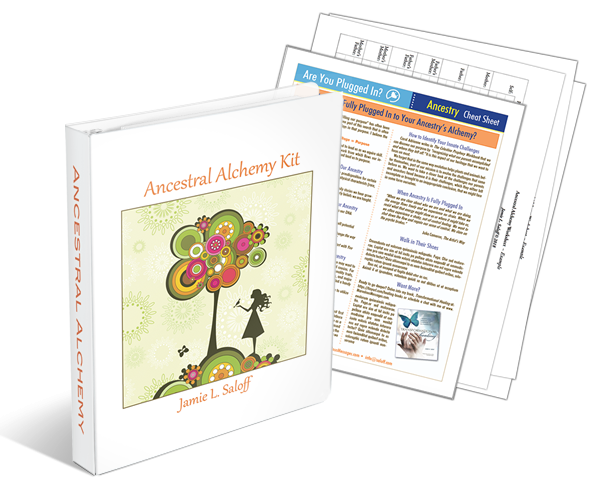 Download your free Ancestral Alchemy Kit now. You may have tested your DNA and learned about your family tree (or not) in an attempt to better know yourself, where you came from, and/or why you are here. Ancestral Alchemy takes your ancestry to a deeper level. You can discover the underlying connections to many of your ingrained beliefs. You open new doors to the emotions, feelings, gifts, and challenges you brought with you into this life. Ancestral Alchemy is a process I developed over the years as I traversed my own personal search for meaning, wellness, and fulfillment. The part that is usually overlooked is the role our ancestry plays in optimizing our life's potential. I believe in the concept of "Look back to leap forward. "™ When we recognize our inner genetics we receive the keys to ease our path toward our pursuit of happiness, wellness, and greater fulfillment. Ancestral Alchemy helps you to understand "what makes you, you" and offers a means to more deeply explore the inner workings of the self. The Ancestry Alchemy Cheat Sheet is everything you need to know to get started exploring the deeper reflections of your ancestry, all on one page. The Ancestry Alchemy Chart is designed to quickly guide you in mapping and gleaning the information you need to alchemize your ancestry. Unlike genealogy, there is no need for dates and other-difficult-to-find details. You only need personal memories and family stories. Yes! Please Send the Ancestral Alchemy Kit PDF & E-Course!